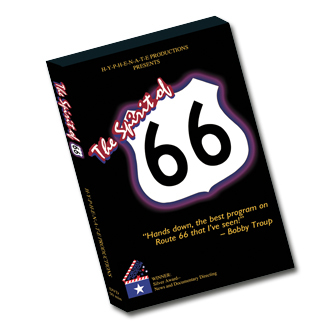 The pilot episode of a proposed 10-part series to eventually cover the entire route, The Spirit of 66 focuses on the natives along the way-- their stories, recollections, tall tales, anecdotes, and folklore; as well as on the experiences of those who have been drawn here on their own personal, sometimes spiritual, quests. Highlights include: *Bobby Troup as you've never seen him-- singing his own version of Get your Kicks (on Route 66), resurrecting memories, and winding through treelined asphalt streets behind the wheel of a '41 Buick convertible. *over 200 proud hometown folks "... standin' on a corner in Winslow, Arizona..." singing along to Jackson Browne's Take it Easy, the song that put them on the map. *an historic first look at the caves of Two Guns, Arizona, battleground of Navajo and Apache... the spirit of whom, no doubt, perpetuate the lore of this eery place. *and chats with people along the way... in cafe booths and barber chairs, from behind the wheels of vintage cars, or atop glittery soda fountain stools... historians, longtime residents, and curious newcomers alike-- all sharing a spirit of adventure, a hearty appetite, and the value of a good story.